I've tried their 'Beautiful Skin' moisturiser range quite recently, and although the night cream is excellent, I found their day cream just too thick for my skin. The 'Essential Moisture' range, however, is even better. The day cream is the perfect consistency, and nourishes your skin, giving the perfect base for make-up, without making it feel to heavy and greasy as some moisturisers do. The 'Essential Moisture' night cream could quite possibly be the best face moisturiser I've ever tried. 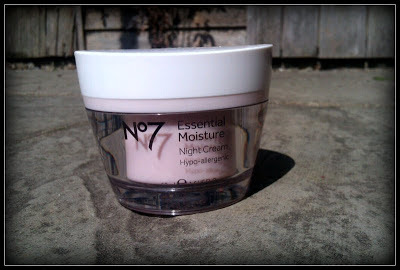 No7 claim that it gives "your skin a little beauty sleep", and I couldn't put it any better myself. 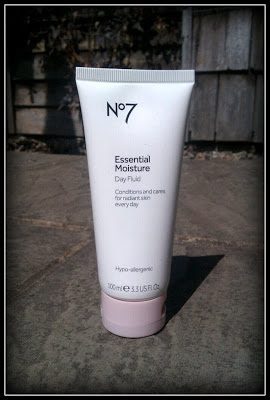 It's quite a thick formula, but soaks into your skin instantly, working its magic overnight. With other brands, although it softens my skin, it's often still quite dull in the morning and craving a bit of foundation to make me look semi-awake. 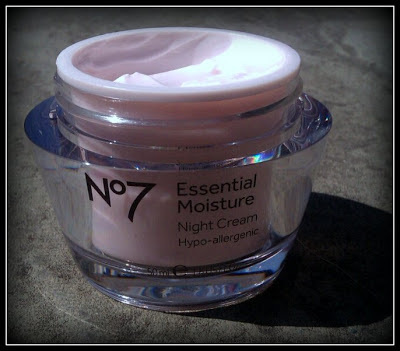 However, No7's 'Essential Moisture' night cream however, not only leaves you with smooth, soft skin, but also gives you skin a bit of a pick-me-up, taking the edge off that dullness and tiredness. 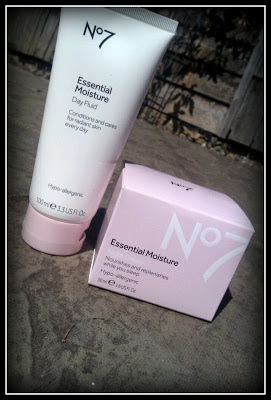 Available in Boots, both the 'Essential Moisture' day (100ml) and night cream (50ml) are priced at £9.95 each.